It's not quite a Reese's Peanut Butter Cup, but this recipe for Fudge-Filled Peanut Butter Cookies makes a delicious homemade treat. 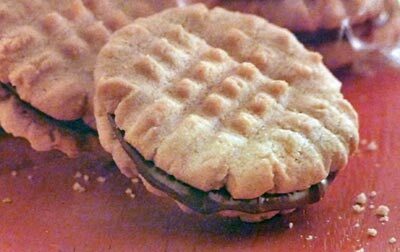 These sandwich cookies are easy-to-make and begin with a traditional peanut butter cookie that envelopes a delcious melted chocolate filling. The most time-consuming part of this recipe is probably rolling the cookie dough into balls before baking. But from then on, it's a breeze and they will bake in only 4 to 8 minutes. And once your cookies are completely cooled, you can melt the chocolate filling and then spread onto the cookie bottoms and assemble them. I love peanut butter any day of the year, but did you know that on January 24th the U.S. celebrates National Peanut Butter Day? Can you think of any better way to celebrate than with these yummy chocolate fudge-filled peanut butter sandwich cookies? I haven't tried this yet, but if you are short on time, you could probably pick up some refrigerated peanut butter cookie dough and save some time measuring and mixing and simply bake as directed on the package. Preheat oven to 375F degrees (if using dark or nonstick cookie sheet, heat oven to 350F degrees). Line your cookie sheets with parchment paper, silicone liners or use ungreased sheets. In a large mixing bowl with an electric mixer on medium speed, beat 1/2 cup peanut butter, shortening, granulated sugar and brown sugar until fluffy. Beat in egg until smooth. Beat in flour, baking powder and baking soda until well combined. Roll cookie dough into 1-inch balls and place about 2 inches apart onto ungreased cookie sheets. Flatten balls to 1/4-inch thickness by pressing with a fork in a crisscross pattern. Bake for 4 to 8 minutes, or until bottoms are golden brown. Remove from oven and transfer cookies to wire racks and cool completely, about 30 minutes. Prepare fudge filling: In a small microwavable bowl, microwave chocolate chips uncovered on High about 1 minute or until softenend; stir until smooth. Stir 1/4 cup peanut butter into chocolate until smooth. Cool chocolate fudge mixture to room temperature or until thickened and spreadable. Sandwich pairs of cookies, bottoms together, with 1 teaspoon of the chocolate fudge filling. Let cookies stand until the chocolate filling is firm, about 1 hour. This recipe makes about 24 Fudge-Filled Peanut Butter Cookies.